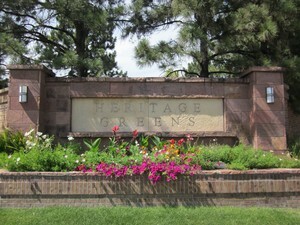 The Heritage Greens neigborhood in Centennial, Colorado sits on rolling hills that provide wonderful vistas of the Rocky Mountain Front Range to the west. Residents enjoy the open space greenbelts and recreational facilities that include a swimming pool, tennis courts, playground and park. Maintenance and operation is provided by the Heritage Greens Homeowners Association (HOA) in which membership is included with the purchase of a Heritage Greens home. The Association also helps to protect property values by establishing and maintaining high standards of architectural control, enforced through the Architectural Control Committee. Various events directed by the Social Committee are scheduled throughout the year. Gala celebrations are held during Memorial Day, Fourth of July and Labor Day weekends. The kids especially enjoy the Heritage Greens swim team, the Gators. HOA expenses are met by moderate annual dues. Adjacent to Heritage Greens is the inviting South Suburban Golf Course beautifully engraved into the rolling hills. This is an 18 hole course with a 9 hole, par 3 course as well. There are a select number of homes that back to the golf course with inviting golf course views and sweeping views of the Rocky Mountains from Longs Peak to Pikes Peak. Get an Instant Heritage Greens Market Report by Clicking Here.